I’m a few weeks into my effort and still not sure I could offer a definition to satisfy the folks at Merriam-Webster. For now I suppose I’ll just have to say I know it when I see it – and I’ve seen a lot of it served at the Vienna Inn. While many of the original structures on Maple Street in Vienna, Va., have succumbed to Whole Foods, Safeway and Jiffy Lube, the Vienna Inn has made itself a landmark. The single family home turned dive bar was built in 1925, according to owner Marty Volk. After a stint as Freddy’s Place, it took the moniker currently celebrating its 50th anniversary. Whether drinking Bud bottles, Guinness cans, a Miller Light draft or a self-serve fountain soda, most customers return again and again for the cheap food that’s as familiar as the faces on the other side of the bar. The rest may come for the waitresses. By design or not, the staff averages 18-24 in age and consistently lacks a Y-chromosome. 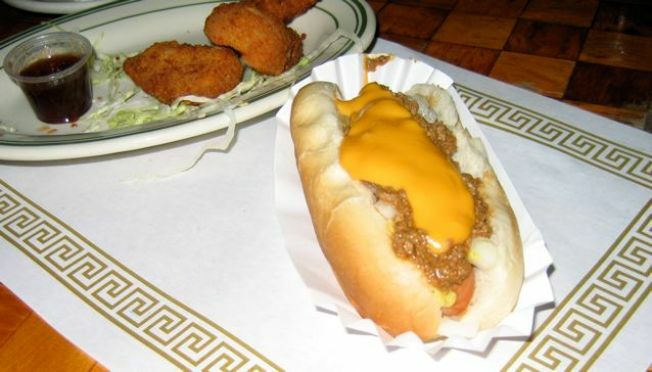 Eating my second chili dog with everything, I began to understand why the bar stools have worn holes in the vinyl floor. The food here isn’t great and the place is dingy, but everything reeks of familiarity. Patrons don’t go for the area's best Reuben (though you can get a decent one). They go to fuel up and spend time with the staff and friends. They go to watch their favorite team or just to blow off steam. And they go to eat hot dogs. They didn’t know what they missed. And honestly, I didn’t mind. Headed back inside I watched orders for wings, sandwiches and a few hundred hot dogs define bar food as much as a way of life.